Dislocation of the patella occurs when the patella moves out of the patellofemoral groove, (called as trochlea) onto a bony head of the femur. If the kneecap partially comes out of the groove, it is called as subluxation and if the kneecap completely comes out, it is called as dislocation (luxation). Patella dislocation is commonly observed in young athletes between 15 and 20 years and commonly affects women because the wider pelvis creates a lateral pull on the patella. Some of the causes for patellar dislocation include a direct blow or trauma, twisting of the knee while changing the direction, muscle contraction, and congenital defects. It also occurs when the MPFL is torn. Your doctor will examine your knee and suggest diagnostic tests such as X-ray, CT scan, and MRI scan to confirm the condition and provide treatment. There are non-surgical and surgical ways of treating patellofemoral dislocation. Footwear to control gait while walking or running and to decrease the pressure on the kneecap. Physical therapy is recommended which helps to control pain and swelling, prevent formation of scar of soft tissue, and helps in collagen formation. The physiotherapist will extend your knee and apply direct lateral to medial pressure to the knee which helps in relocation. It includes straightening and strengthening exercises of the hip muscles and other exercises which will improve range of motion. Lateral-release: It is done to loosen or release the tight lateral ligaments that pull the kneecap from its groove which increase pressure on the cartilage and cause dislocation. In this procedure, the ligaments that tightly hold the kneecap are cut using an arthroscope. Medial patellofemoral ligament reconstruction: In this procedure, the torn MPF ligament is removed and reconstructed using grafting technique. Grafts are usually harvested from the hamstring tendons, located at the back of the knee and are fixed to the patella tendon using screws. The grafts are either taken from the same individual (autograft) or from a donor (allograft). This procedure is also performed using an arthroscope. Tibia tubercle realignment or transfer: Tibia tubercle is a bony attachment below the patella tendon which sits on the tibia. 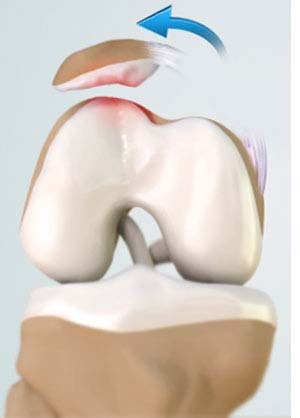 In this procedure, the tibia tubercle is moved towards the centre which is then held by two screws. The screws hold the bone in place and allow faster healing and prevent the patella from sliding out of the groove. This procedure is also performed using an arthroscope.